If you will be having guests coming to visit in the new year, the increase in cooking, kitchen sink use, bathroom use, laundry frequency, and overall water usage can be hard on your plumbing systems. Therefore, the risk of having to deal with a plumbing issues increases, too, but don’t let any kitchen or bathroom plumbing problems ruin your time with out-of-town guests. Rather, take a look at these helpful plumbing care tips from our Mojica plumbers in Round Rock to avoid common plumbing issues such as clogged kitchen sinks, disposal problems, clogged bathroom drains, toilet troubles, and hot water issues. And of course, you know you can always call on our plumbing team to take care of any plumbing issues that come up so that you can get back to enjoying your time with visiting friends and family. Please continue reading below to learn more. When cooking oils, excess grease, and lard go down the drain, these are all incredibly hard on your kitchen’s disposal and pipes, as they can solidify and cause clogs or slow draining. Coffee grounds, egg shells, and grains can also harm the disposal and cause clogs in the pipes. To avoid a clog in your kitchen plumbing, or an issue with your disposal, try pouring cooking oils and fats into a cup or bowl lined with aluminum foil, and then toss it on the trash can once it has cooled down. Always dispose of coffee grounds in your compost bucket or in the trash can, and throw egg shells and grains directly into the trash receptacle. A common snack to put out for guests are those delicious crunchy and fibrous vegetables like carrots, celery, and broccoli. Rather than putting your garbage disposal into overdrive, opt to either throw these uneaten veggies in the trash or compost. Doing so will also keep your pipes clear of unground debris. First off, you’ll want to make it clear to your guests what should be thrown in the trash rather than flushed down the toilet. It may be a little awkward, we know, but trust us, laying the rules out will keep everyone on the same page in order to avoid toilet clogs and overflows. For instance, you can say, “Do throw things like toilet paper and tissues in the toilet, but don’t flush baby wipes, cotton balls, paper towels, and feminine hygiene products down the toilet.” You could even have a little fun with it to make it less awkward by hanging a funny sign on the wall that says, “You break it, you clean it.” In reality, some people are just unaware of the dangers of flushing anything other than toilet paper and tissues, but nobody wants to be the one to cause a clogged toilet. For those folks with long hair, their hair tends to shed more than those with shorter hair. When brushing hair at the bathroom vanity, strands of hair tend to fall right into the sink, which often gets washed down the drain where it gathers with soap scum and other debris. Likewise, longer hair strands also go down the shower drain and can build up in the pipes. The outcome is usually slow draining or clogged sink and shower pipes, which can turn into a nightmare if not addressed. Family members and guests with long hair tend to shed in the shower and at the sink from washing and brushing. The best way to avoid this is to pick up a couple of drain covers for each bathroom in your home. These covers will catch hair from going down the drain while still allowing water to flow through. Of course, you can always call our Mojica plumbers in Round Rock for a thorough drain cleaning before and after your guests come to stay. When guests come to stay with you, it means more daily showers, and an increase in running the washer. Nobody wants to be the last one to take a shower, because that usually means a cold shower, however, there are a few ways to maximize hot water and water pressure. First, you’ll want to run the washing machine and the dishwasher at night. You can run them in the morning, too, but that might affect how much hot and warm water is left for those early risers. It’s always more energy efficient to wash your laundry in cold water, but some items require a warm or hot cycle. When you have guests staying with you, try to only use cold water when doing laundry to save the hot water for showers. You can also temporarily increase the temperature of your water heater slightly while your guests are visiting, but be sure to turn it back down once they leave to keep your utility bills low. Enjoy Your Time With Friends & Family! 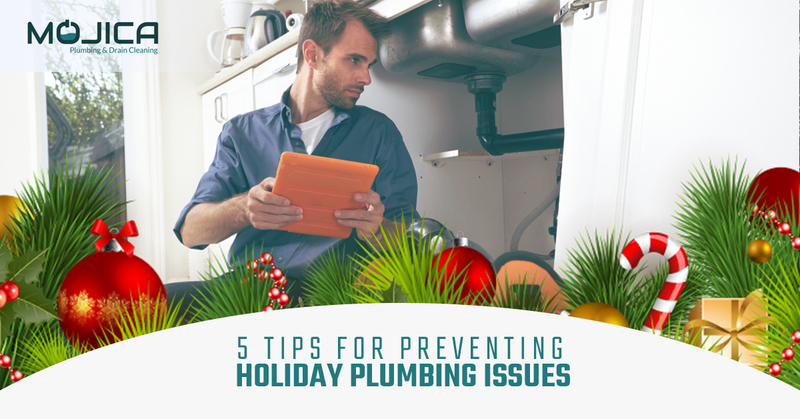 Follow these tips to avoid any unnecessary plumbing issues that may arise when you have friends and family visiting. If you do experience a plumbing issue, need a drain cleaning, or want a new hot water heater installed, our friendly and knowledgeable Mojica plumbers in Round Rock are here to resolve your plumbing issues. Give us a call today to schedule a plumbing appointment. Thank you for reading our blog! Be sure to like, comment, and share our video that accompanies this blog!